So you might be wondering what I’ve been up to since not making a team to go to Europe… And well if not, you can probably stop reading this post right now. Ever since leaving Jericho an epic battle has been raging on here in Lake Placid. Corrine vs. Her Health. Want to guess who’s winning? If placed your bets against me you may now collect your imaginary winnings. After completing a really great bout of amoxicillin and some good old fashion racing in the cold my body continued to call it quits. The upper respiratory track infection I was confident I was squashing fought back with gusto! And so… another round of antibiotics was ordered. Yep. Antibiotics round 2! We are bringing out the big guns this time. Augmentin aka SUPER amoxicillin. And for those of you who have been counting, you’re right, I will have spent most of the month of January pumping medication into my system. Bring it on February! While my health is a constant battle… in time I’ll win this one. in time. In the mean time I’ve turned my attention to training. Its the best thing I can do. I’ve decided I’ll just have to be (spoiler alert) America’s best kept secret until next season… and then I’ll take Europe by storm. Until then I get better. Shooting, skiing, the works. Back to basics, have to start from somewhere. Jonne and I headed to the range this morning for some slow fire. An activity generally reserved for the spring and early summer. Its great to get this extra work in, and its incredible to see the improvements I’ve made since moving to Lake Placid in May. 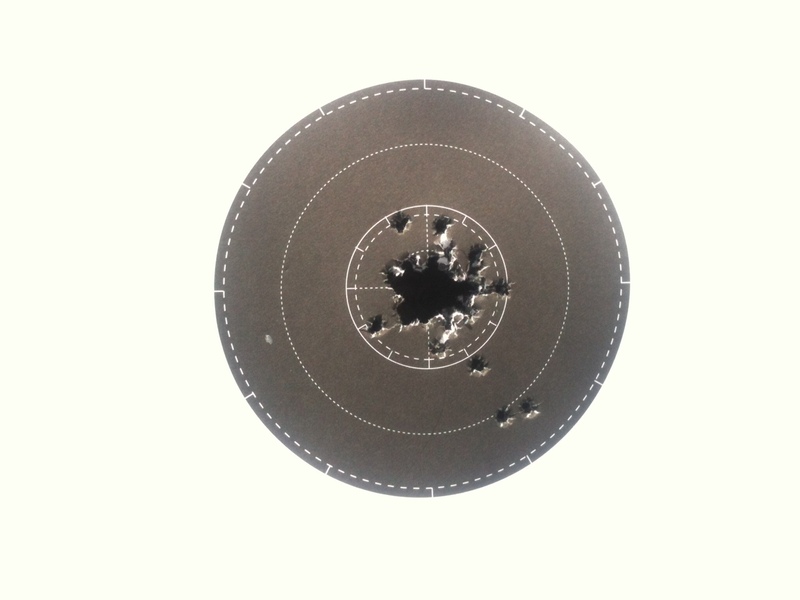 That is my grouping from this morning! I can’t remember exactly, but there is between 35-40 shots on that piece of paper! Shooting prone without a sling. For those of you not familiar with a biathlon rifle. We have a sling attached to the bottom of our rifle that hooks into a cuff worn on our non-shooting arm. It helps you form a very solid steady shooting base. To shoot well without the sling you have to keep your nonshooting arm both stable and relaxed. Can you say, Goodbye 10-ring? Here’s the video from one of the clips. Steady, smooth, BOOM! wow impressive shooting! I thought I was a pretty good shooter, but shooting that w/o a cuff…i don’t know that would be hard! congrats! Thanks Hilary! Congrats on some super shooting in Fort Kent last weekend!